As bicycling for transportation purposes becomes more and more common in urban areas, so too do bicycle accidents. One of the most severe injuries that any cyclist can suffer is a traumatic brain injury, which can lead to very serious long-term injuries and even to death in severe cases. 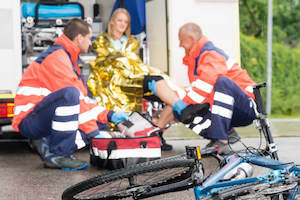 If a bicycle accident was caused by negligence, the cyclist may be able to recover from the responsible party through a personal injury lawsuit. The attorneys at Slappey & Sadd have extensive experience representing clients who were injured in bicycle accidents and use that experience to ensure that you are compensated for your bicycle accident injury to the maximum extent that you deserve. We serve the entire state of Georgia, including Rossville, Loganville, and Dalton. A traumatic brain injury is an injury to the brain that is caused when an external mechanical force causes brain dysfunction. This is normally caused by a violent blow or jolt to the head that causes the brain to move back and forth inside the skull. The brain heals differently than other body parts, and therefore, the effects of traumatic brain injury can be very difficult – or even impossible – to overcome. The immediate effects of traumatic brain injuries are divided into physical symptoms and cognitive symptoms. The physical symptoms of mild traumatic brain injuries can include a short loss of consciousness (a duration of a few seconds to a few minutes), headache, nausea and vomiting, dizziness and loss of balance, and fatigue or drowsiness. Cognitive symptoms include blurred vision, ringing in the ears, a bad taste in the mouth, mood swings and mood changes, and memory and concentration problems. Traumatic brain injuries can lead to a wide variety of long-term injuries that require medical care for the rest of the injured persons’ life. Such injuries can include language and communication problems, memory and cognitive problems, emotional problems (such as depression, anxiety, or post-traumatic stress disorder), sensory problems, and behavioral problems. The risk of suffering a traumatic brain injury while riding a bicycle is higher than the risk involved when riding in a vehicle because bicycles afford very few safety mechanisms. Instead, bicyclists are left vulnerable to every danger of the road. As a result, cyclists are often thrown from their bikes during accidents, which increases the risk that a cyclist will bang his or her head against the pavement or a vehicle. Wearing a bike helmet can help minimize the risk of suffering a traumatic brain injury, but it cannot eliminate it completely. Most bicycle accidents are caused by either road defects or collisions between cyclists and automobiles. Road defects commonly cause bicycle accident injuries because the vast majority of U.S. roads were designed primarily for automobiles. Obstacles that present little risk for motorists, such as potholes, railroad tracks, and steel plates, can be quite dangerous for cyclists. Collisions between cyclists and automobiles are another common occurrence and are often the result of motorists simply not seeing the cyclists before it’s too late. Rest assured that, no matter what caused your bicycle accident, our attorneys will competently represent your interests.